One of the greatest honors Mommy has ever received was the day she was accepted as a member of the Cat Writers Association, and we're always thrilled when asked to review one of our fellow member's books. Today we're reviewing three of them, and each one would make a purrfect edition to any cat lover's bookshelf! From the publisher: Are you a cat owner or are you thinking about becoming one? If cats have already cast their magical spell on you, you'll find valuable information for you and your feline friends. If you're getting your first cat or find yourself unexpectedly living with a feline roommate, welcome to the cat fancy. Get ready for a whimsical, enchanting, and affectionate lifelong relationship! 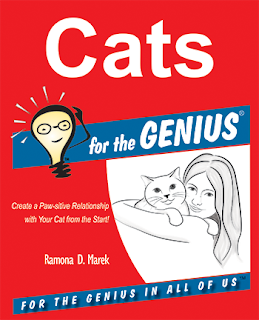 Cats for the GENIUS is written with clever wit and in an easy-to-read conversational style common to books in the For the GENIUS series. It is your comprehensive owner's guide to everything feline. 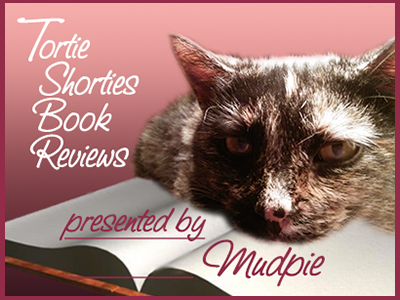 Tortie Shorties Review: We all have cat care books on our shelves that we dust off only to look up a medical or behavioral problem when it crops up. This isn't one of those books. I read my copy cover to cover and found myself learning new things even after nearly 4 decades of cat ownership! It covers everything you need to know from start to finish, from choosing the right cat for your lifestyle and preparing your home for your new family member to inevitable end-of-life decisions. It's well-researched yet conversational, told in an easy-to-read style accompanied by fun and informative anecdotes. I can't think of a better gift for someone adopting a cat for the first time...but longtime pet parents will find much to enjoy here too! From the publisher: This new edition is a vet-approved, authoritative guide to homeopathy, supplements, and hundreds of other new choices for keeping dogs and cats healthy! Push the "aspirin" point for instant pain relief (page 135). 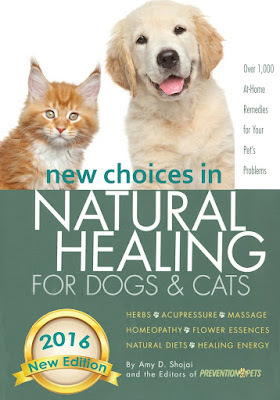 A one-week plan to get rid of fleas-- without harmful chemicals (page 263). Discover for yourself how America's top holistic veterinarians treat their pets without using drugs...and how you can do it, too! Tortie Shorties Review: It's no secret that I'm a huge fan of natural healing, both for myself and my pets. Over the past decade I've used everything from acupuncture to Reiki to herbs with a holistic vet right alongside traditional medicine with my regular vet. As soon as I received this book I went to the section on asthma and received confirmation on things I've already been doing (flower essences & treating the environment) while also learning other ideas to put into practice. While we must trust in mainstream veterinary medicine, I strongly believe that we can do more for our pets through alternative holistic treatments and this book is the most comprehensive guide I've found for anyone just beginning to navigate this fascinating new world to people like me who've been studying the topic for years. It's a book that will remain at my fingertips for as long as I'm a cat mom (in other words, for a lifetime). 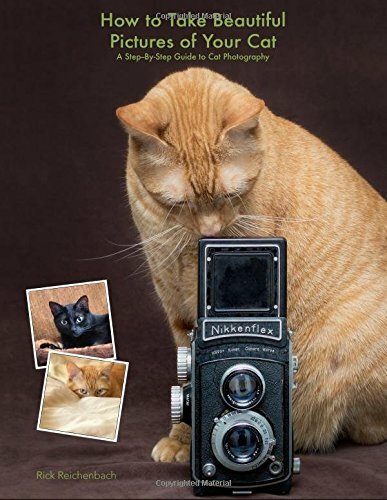 From the publisher: This award winning guide to cat photography offers easy to follow tips and recipes that allow anyone to capture amazing pictures of their furry companion. A central theme of the book is learning how to turn your cat's habits to your photographic advantage. From candid photos to portraits to fun cat pictures, over 90 example images walk the reader thru planning, staging, lighting and photographing cats. Along the way, the book explains essential photography concepts like depth of field, lens selection, composition and postproduction techniques for cat photography. In depth, step-by-step instructions describe various lighting techniques to establish mood using both natural light and flash. How to Take Beautiful Pictures of your Cat was awarded a Certificate of Excellence by the Cat Writers' Association. It makes a valuable addition to the bookshelf of any cat lover or pet photographer. Disclaimer: I received free copies of these books from the authors in exchange for fair and honest reviews. I really like the photography book! Gray review!! These all sound like great books! I'll have to add them to my "to read" list. These all sound like such helpful books. I, too, am always looking for ways to better photograph my furbabies, especially the active ones who simply won't sit still for a photo shoot (ahem, Eddy). Thank you so much for sharing these with us, Melissa and Mudpie! These sound like three really useful books. That photography book is definitely going on my "must-have" list! thanks for sharing! These books all sound awesome! I would love to get that photography book - improving my photography is one of my goals for the next year. Thanks for these great reviews! Thanks so much for the mention of the Natural Healing book. Looking forward to adding the others to my library. Thanks for the reviews, Mudpie! You're the best! Good thing Christmas is coming because I want all of these. The complete start to finish experience with this Flowers Delivery was perfect. She is extremely friendly, service oriented, and responsive to emails & phone calls. Even with a big event they were planning for one evening she still managed to take care of my one arrangement.